Thanks to inspiration from a number of friends who make this an annual tradition, I’ve taken a good long look back at my photos from the year to try and nut out a top ten list for 2011. At first it was quite easy, but by the end of the year, I’d found 23 photos that I felt could make the cut. I’ve culled the list down, and present – this year’s top ten. As I’m a bit of a lazy sod, preferring to actually get out trackside with the camera (and then retire to a hotel for a beverage or two in good company, rather than hunch over an LCD screen to sift through photos), a lot of photos from the year have not yet been uploaded to Flickr. Perhaps you might disagree that these are the best photos I’ve taken in 2011? Comments are appreciated, and I would go so far as to suggest that creating a “top ten” list is an important one for all railway photographers. A form of self critique, in a way – what have I achieved this year? What can I improve on? What makes this shot more important than that one? Indicator Boards at Leightonfield – March 18th. 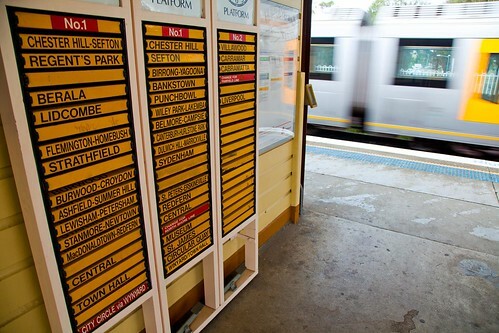 The old roller type indicator boards are slowly becoming an endangered species on the CityRail network. With dwindling staff numbers at stations, and an ever expanding need to provide customers with up to the minute information on easy to read and easy to access computer screens, there just isn’t a place for these old indicator boards… except perhaps in a museum! I recall arriving at the station at the same time as NY3 steel freight, without time to line up a “standard” shot, I instead went for the shot with the indicator boards. Needless to say, it didn’t work out, and so, with a bit more time to spare, I tried again with a passing suburban train from the city. Aside from cutting off a tiny bit at the bottom of the board, I feel it worked quite well. Dusk in The Cullerins – April 30th. Thanks to a tip off from a friend up in Newcastle, we’d found out that 8134 loaded grain train was expected to arrive into Sydney behind X45, 48122 and X48. The downside was, due to the slow running speed of this train, it was to follow the evening XPT into Sydney, arriving a long time after dark. 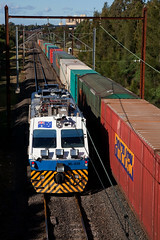 Our party had spent the day around the Goulburn area, photographing various Pacific National and El Zorro trains. With the afternoon XPT sighted climbing through the Cullerins in the brilliant late afternoon sun, we moved to the station at Gunning to make the most of the remaining dusk light. When we saw 8134 for the first time, it was following another loaded grain train (behind a pair of 81 Class). We got our first shot at Gunning, before moving on in chase – we were racing the remaining light as much as the train! With the train in front combined with the steep grades, it was no issue getting ahead of the train and over to the other side of the hill, but by then the sun was merely an afterthought. Regardless, this shot turned out to be my favourite from the day! A Depot Scene – May 8th. A generous invitation from Les Coulton to join him in Ballarat for the Ballarat Heritage Weekend shuttles saw a quick decision to fly down to Victoria to accept. Steamrail Victoria took D3 639 and their carriages to Ballarat to join with local resident Y112 to run a number of shuttles between Ballarat and Sulky. As well as being involved in riding on and photographing the train, the invitation extended to staying in the sleeping car at the Ballarat depot! This allowed for plenty of memorable moments, one of which was watching the locos being prepared for service in the morning. 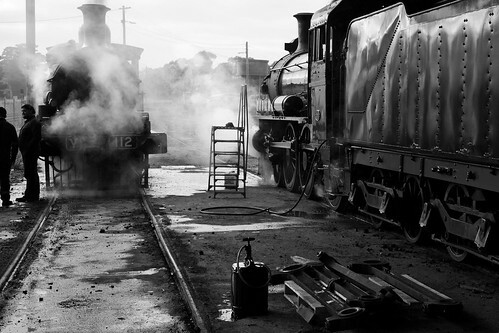 As a nod to the passengers, as well as the lineside photographers who came out to support the train, both locomotives were turned on the Ballarat turntable on the Saturday afternoon, to allow the locomotives to run in reverse order for Sundays shuttles. 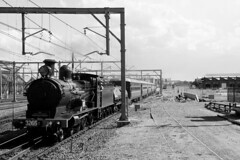 This photograph was taken shortly before Y112 left the depot to attach to the cars at Ballarat Station. ML-039 Passing St Leonards – July 3rd. St Leonards Station is quite an impressive structure – when originally built, it was a pair of unremarkable side platforms to serve a North Shore suburb. Between 1989 to 2000, the station was relocated to a temporary location on the city side of the Pacific Highway overpass, to allow a complete redevelopment of the current station site. 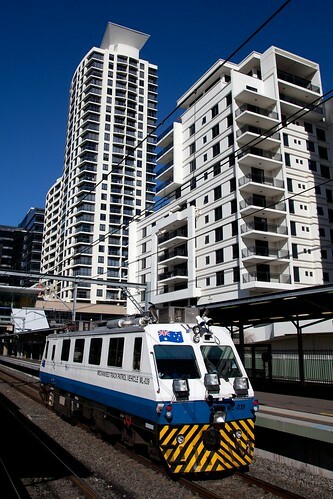 As part of the development, the air above the station was handed over to developers to build apartments, and the new station was built with allowance for four tracks, for future enhancement to the St Leonards to Chatswood corridor as part of a proposed second Sydney Harbour crossing. Fast forward to 2011, and platforms one and four remain unused, with the status quo very much maintained. 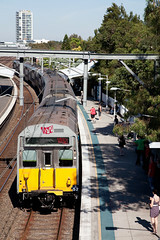 This shot was taken on an opportunistic whim – I had heard that mechanised track inspection vehicle was going to be running over the North Shore line on that day (hardly an unusual occurrence), including a visit to check all of the sidings at Lavender Bay, as well as inspection of the middle tunnel roads at North Sydney, and Lindfield turnback. I’d wanted to shoot a train at St Leonards using the station as a backdrop for a while, and this presented a rather unique oppertunity. With news surfacing that the NSW Government are looking to buy two new mechanised inspection vehicles in 2012, the future of ML-039 is far from safe, I felt this was quite appropriate. Staff Exchange – July 17th. During July, I entertained Crisfitz from Railpage, a former driver and train controller from Western Australia. I (and a couple of the usual suspects) showed him some of the more interesting locations and photospots that the area immediatly around Sydney has to offer. One of the activities on Cris’ list was to go for a ride on the Zig Zag Railway, at Lithgow. After first photographing the train paralleling Bells Line of Road, we then raced down to Bottom Points Station to purchase our tickets and board the train. We took great, childlike delight in riding the train up the Zig Zag, pausing for photos of 1049 (as well as the railmotor that was also running on the day) at Top Points during the runaround, as well as more photos at Clarence (and Top Points again on the return journey). Despite all of the atmospheric shots obtained with the DSLR, I felt this was probably one of my favourites of the day. Taken on the iPhone 4 using the Hipstamatic app, I was able to capture the staff exchange at Top Points signal box without the risk of losing my head (or, indeed, headbutting the poor signaller). G535 at Milvale – August 21st. The backstory to this photo is staggering – if every picture tells a thousand words, then perhaps I need to find a thousand words to describe how the picture came about! Long time enthusiast and companion Todd had been encouraging me to head south to Junee with him to show him some of the spots, and (hopefully) get some photos of trains away from the mainlines. Imagine our surprise to find out that, due to trackwork on the Unanderra to Moss Vale line, most of the grain trains that regularly ply the states southern regions were parked up with no work to do! 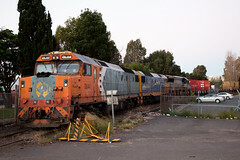 The trains we were interested in (the QRNational rake for Glencore Grain and the two El Zorro rakes for Grainflow/Cargills) were all stabled – El Zorro had one rake at Junee, and the other at a siding near Stockinbingal, while QRNational were quite safely parked in Goulburn. On the final day of our (rather quiet) weekend, we noticed movement beginning for the lines re-opening on Monday. QRNational were sighted loading their train at Red Bend (south of Forbes), while El Zorro were preparing to depart Junee at the same time. We found ourselves overlooking an impressive Canola field at Weedalion, the perfect shot set up for the approaching QRNational train. That was, until the train was refuged at Bribbaree! Rather than wait around for it to appear, we instead headed south to Milvale to wait for the Parkes-bound El Zorro train. Having got our shots of G535, EL60, 4816 and 4836 approaching the yard, we prepared to give chase to Bribbaree to get QRNational departing, before heading to Goulburn to spend the night. We didn’t count on the El Zorro train going into the refuge at Milvale! With the sun rapidly fading, we resigned ourselves to waiting at the country end of the loop at Milvale to see what would eventuate. 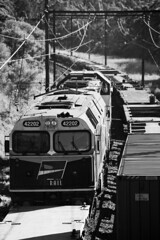 A loaded PN wheat train from Parkes sub-terminal, bound for the Allied Mills facility at Maldon raced through behind a pair of 81 Class, before it was time for El Zorro to depart. With the last of the light only minutes away from vanishing altogether, it was only luck that produced the photograph seen above! T6 Approaching Scarborough – 28th of September. There was once a time when Tangara trains were quite common on the line from Sydney to Wollongong (and beyond). Due to a shortage of V-Set intercity trains, quite a few peak and off-peak runs were rostered for 4 or 8 car G-Set “outer suburban” Tangara trains (of course, seasoned commuters would know that with set availability at Motdale, it was not uncommon for many runs to use T Set suburban trains instead). 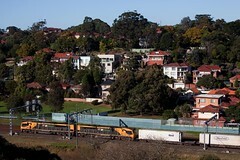 With the introduction of the OSCar carriages in 2006, their first deployment was to the South Coast Line to free up the Tangara carriages for suburban duties. 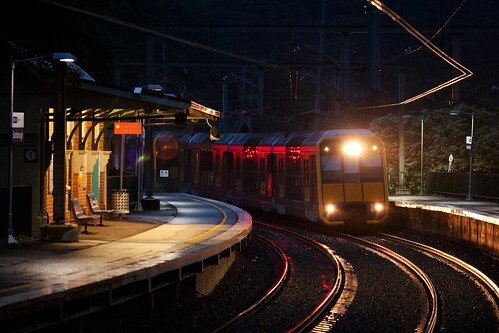 Fast forward to 2011, and the 3 car L-Set trains that once provided local services in the Wollongong suburban area are gone, replaced by 4 car Tangara trains. 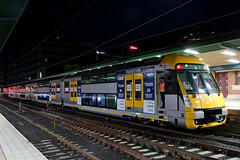 Most (if not all) of the services to and from Sydney are operated by OSCar trains (with one run still operated by a V-Set, at least until early 2012). 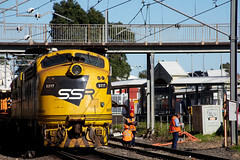 The G-Set “outer suburban” experiment has ended, with all G-Sets having been refurbished by RailCorp to remove the toilets and make them into suburban commuter trains. 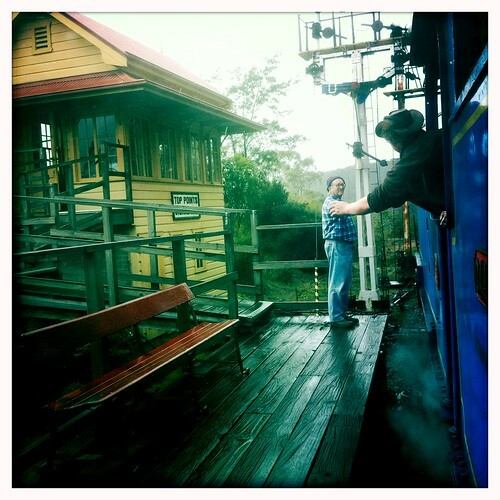 The above photograph was taken in moderate rain at Scarborough, only a few days before the 2011 CityRail timetable was introduced. Every year Heritage Express (the operating arm of the New South Wales Rail Transport Museum, now better known as Trainworks) operates a tour from Sydney to Melbourne and return using their Southern Aurora carriage set for the Melbourne Cup. 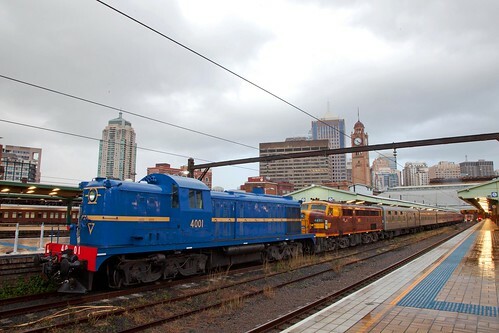 In 2011 the train was run by 4490 and 4520, and while having lunch in the city, the decision was made to pop down to Sydney Terminal to say G’day to some friends who were amongst the crew. 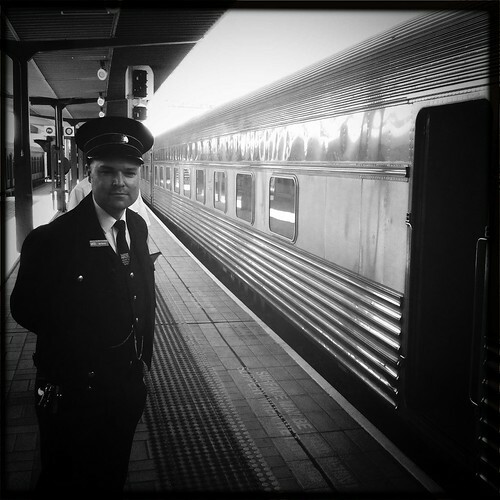 The guard of the first leg of the journey was Ben (seen above in full NSWGR uniform), and I managed to cajole him into standing still for thirty seconds while preparing his train for departure. This is another photograph taken on the iPhone 4, using the Hipstamatic App. Night Eagle – September 17th. Chris and I were returning to Sydney after a day spent on the Main South between Moss Vale and Goulburn, looking for shots of the QRNational/Glencore Grain train. Despite getting a large number of shots of this very photogenic train, we couldn’t pass up the opportunity to shoot NR18 southbound on a diverted 6BM4. NR18 had arrived into Sydney earlier that morning on the Indian Pacific from Adelaide, and was placed on the front of BM4 to assist the train to Melbourne. Normally BM4 does not stop in Sydney, although on this day it did pause in Enfield to add NR18 to the front. We photographed it well after sunset at Loftus behind NR18, NR25 (painted in the previous Indian Pacific livery), NR73 (painted in the original PN NR colour scheme) and NR76 (retaining it’s original National Rail colours). 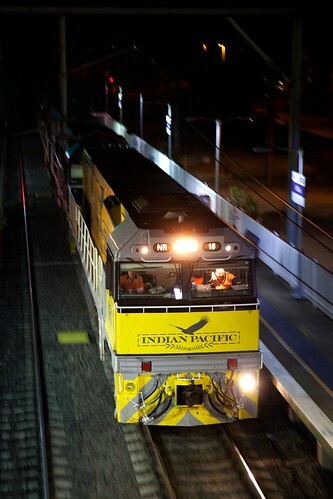 We suspect this was the first time that the new and old Indian Pacific liveried NR Class were used on the same train. At the time of writing, it is not known if any more NR Class will be treated to the new Indian Pacific scheme. 7GP1 Passing Nelungaloo Silo – November 5th. During early November, Todd and I headed west to Parkes, to look for photos of the Manildra feeder services. Although we succeeded in our endeavours, we couldn’t pass up a shot for the departure of 7GP1 SCT superfreighter from Parkes to Perth. The departure of the train was slightly delayed beyond the expected departure time, and as such, we photographed SCT009 and SCT005 passing the disused silo at Nelungaloo at 1935, kicking up a great deal of dust and grass seed that rendered us incapacitated for the remainder of the evening! 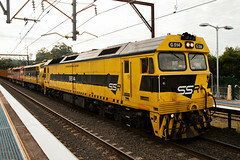 With news of the sale of the 9 former SCT G Class locomotives to other operators (see Trackside, August 2009), G513 and G514 (now owned by Southern Shorthaul Railroad) entered the paint shops at Lithgow during September for repainting, emerging during October, and being sighted on numerous works trains in the Sydney area. 3265 passing Redfern with the first public steam shuttle. 20/9/09. Preserved steam locomotive 3265, which first entered service in 1902, was overhauled and rebuilt by the Powerhouse Museum between 1998 and 2009, and formally re-entered service on September 20, 2009, celebrated by a day of steam shuttles between Central and Bankstown Stations. The day’s festivities began at Central, with 3265 arriving to be greeted by a large crowd of ex-railway men and women, volunteers, dignitaries and photographers present to record the historic occasion. After a short ceremony and morning tea, 3265 ran her first steam shuttle for the day to Bankstown via Sydenham and returning via Regents Park. The first shuttle was reserved for those who had helped make her return to service possible, passengers consisting of VIPs and their invited guests. The second and third shuttles, also running to Bankstown via Sydenham and returning via Regents Park, was open to members of the public who had snapped up tickets. Since her return to service, 3265 has been used on a 3801ltd Cockatoo Run special to Moss Vale via Wollongong, as well as a private charter to and from Hurstville, with at least two more tours planned for 2009, including a triple headed steam trip up the Blue Mountains in November, and a private charter in early December. The Powerhouse Museum plans to operate up to six tours a year with 3265, usually in conjunction with another heritage operator. 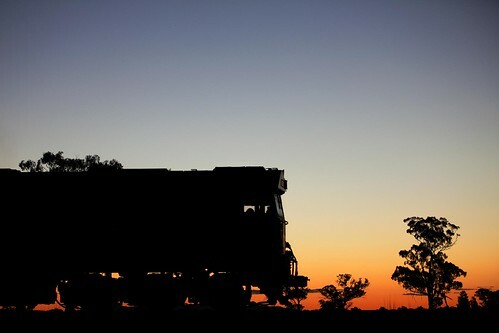 In a joint venture with Xstrata, a Swiss mining company, Freightliner will enter the lucrative Hunter Valley coal haulage market, using locomotives and rolling stock provided by Xstrata. 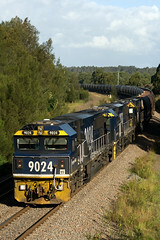 Xstrata is planning to purchase three 90-wagon rakes and nine locomotives with an eye to commencing operations by 2011. Bradken will be building the wagons, with the locomotives provided by United Goninans. 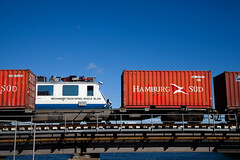 While the trains will be owned by Xstrata, Freightliner will operate the trains under the name of “X-Rail”. Pacific National will still continue to haul up to 30 million tonnes of export coal for Xstrata. Currently Pacific National handle all of Xstratas export coal as part of a decade long contract signed in July 2009. The deal accounts for 30 million tonnes of coal per annum, although with additional mines planned to open in the next couple of years, additional capacity would be required, which will be covered by X-Rail trains, hauling the additional 10 million tonnes of coal each year. 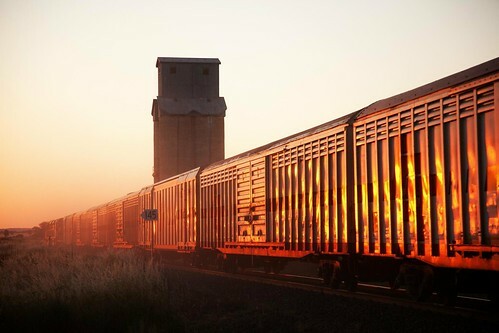 Speculation as to who would haul the additional 10 million tonnes has now been laid to rest, as originally the additional freight was up for haulage by either Pacific National or QRNational, the two existing operators in the Hunter Valley. If the venture is successful, it may lead to X-Rail hauling more of Xstrata coal as more mines open and existing mines increase capacity in the future. With the cessation of the fuel service to Canberra looming, one could be forgiven for thinking that the future of the line is in doubt. When the Premier visited Queanbeyan on September 18, 2009, he was not announcing the removal of the CountryLink Xplorer service to Canberra, rather, an increase in services – an additional eight services a week between Sydney and Canberra (four in each direction). The increased number of trains is actually due to a reduction in patronage, put down to the confusing timetable and irregular service level. Now, with a regular service frequency, and a consistent timetable, it is hoped that patronage will rise again. The increased number of services is thanks to a more efficient use of the Xplorer fleet, as during the current timetable, it is not uncommon for one set to arrive into Canberra at midday from Sydney, and be stabled in the siding until the following morning service back to Sydney. 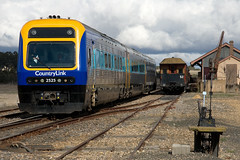 The up midday Xplorer service from Canberra passes an ARHS Heritage train in the yard at Bungendore. Under the new timetable, this will become a daily service in each direction to and from Sydney.